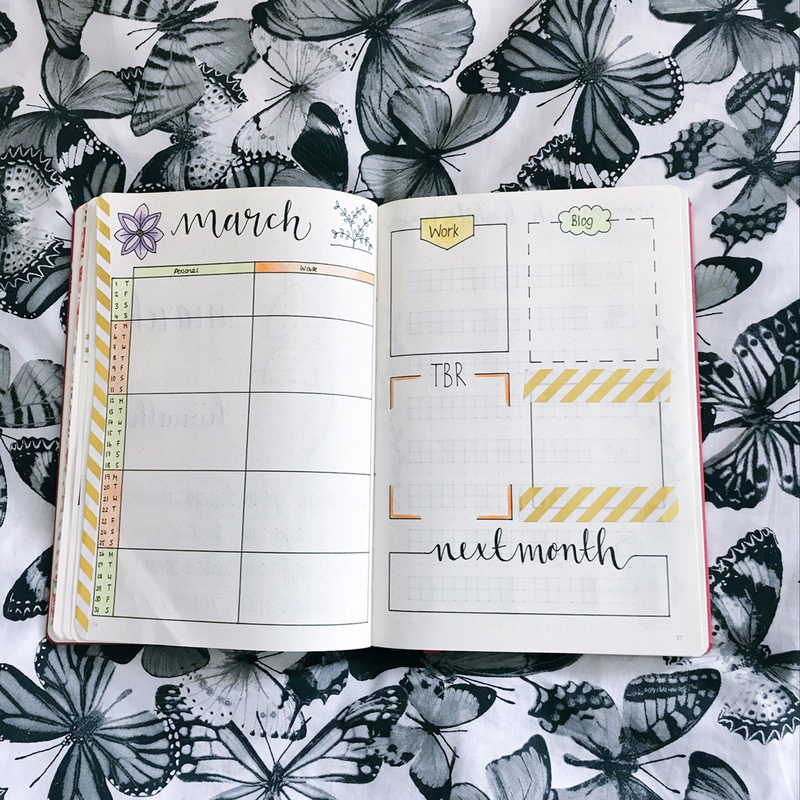 Bullet Journal Post: February Review & March Set Up! Hi everyone! Happy Wednesday 🙂 March brings with it a new month and a new bullet journal post from me! I’m going to show you my completed February spreads and then share my fresh March spreads. If you caught my February set up post, you’ll know I’ve made a couple of changes for the month and I was pretty pleased with how most of them went. I also tried something a bit new in February that I’m keen to show you! So here it goes! All of my staple February pages worked really well for me. You’ll notice I don’t tend to change these and that’s because after experimenting last year I found spreads that work for me, so why change them?! My monthly page was kept simple and I chose a pretty washi tape to decorate the side. I added a splash of colour to my monthly dashboard spread with some reds and pinks. I like to keep this spread simple because it actually ends up holding my month together! Next up are my habit tracker and my ‘happy memories’ page. I love my gratitude log even though it is probably the most simple page in my journal. I love reading back over these moments at the end of each month and they are always there to reach for on a difficult day. In February I tried a different layout for tracking my habits and I actually quite liked it. I thought it looked really neat and compact and was certainly easier to set up that my old way of doing it. The only tricky bit really was that I didn’t label the dates in the boxes so if I fell behind it was a bit of a headache to catch up! My final two staple pages: the mood tracker and my bookish stats. I really love tracking my moods in my journal as I find it a good way to end my day and to reflect on what was good and what was not so good. I thought this geometric heart turned out looking really cool and the colours definitely reflect that February was a good month for me. 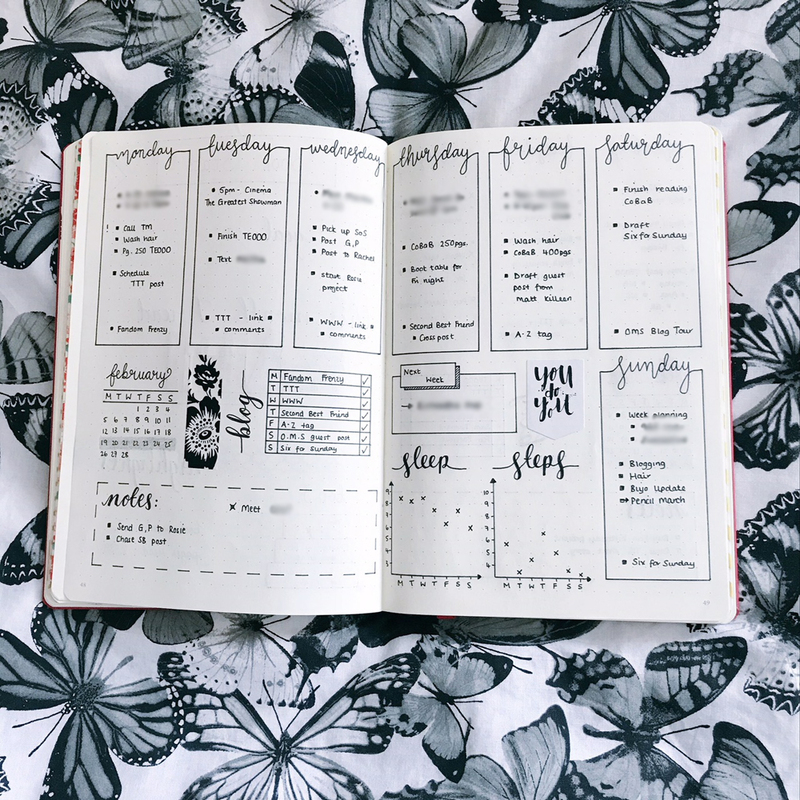 If you caught my most recent bullet journal post about tracking my reading, you will know that I do this in a variety of ways. On a monthly basis, I always keep this page to see what I read in a specific month, it’s simple but effective. My newly evolved weekly spread is going well at the moment. I changed it up a little bit due to the nature of changing my habit tracker and wanting a different way of tracking my steps and sleep. I like this spread at the moment but in future I plan to maybe jazz it up more with some stickers and washi tape to add colour, which is the only thing I really miss on my weekly spreads. Over the last week of February I decided to do something I’ve never actually used my journal for before and that’s to actually journal about my days! It looks a little haphazard at first but I love how I’ve managed to write back about each of my days and also include lots of washi tape, stickers and even a doodle. I plan to do a bit more of this because I think it will add some more character to my journal and because of the nature of how I’ve done it, it also won’t matter if I don’t do it every day. It is March 4th as I’m writing this and I still haven’t set foot in work this month due to snow! 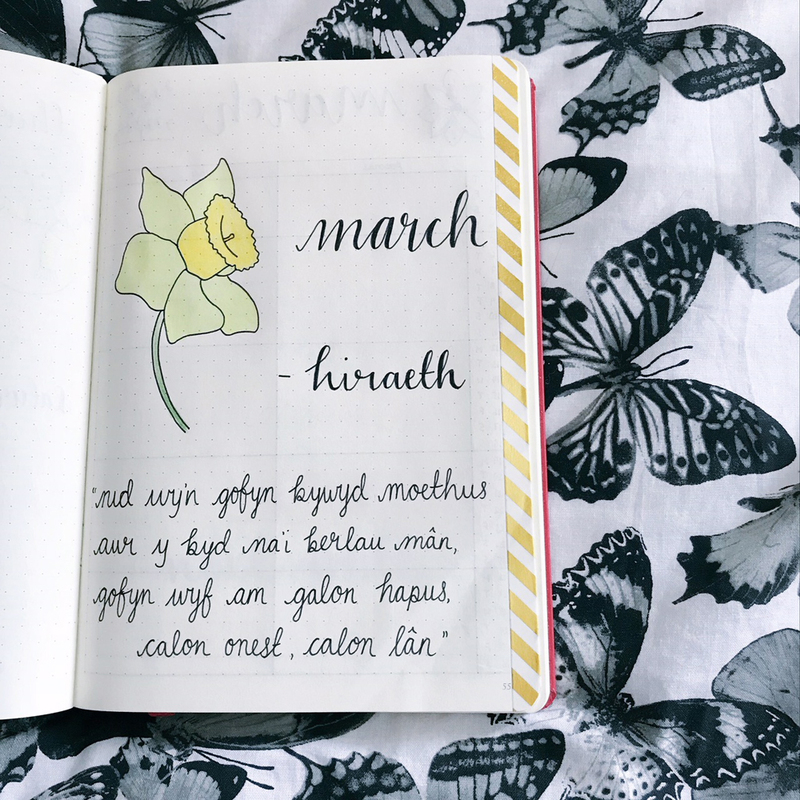 But March 1st is also the date we celebrate our patron saint St David here in Wales so the natural decoration for my monthly page was a daffodil and the first few lines of my favourite song Calon Lan. I also included the word ‘hiraeth’ which doesn’t really have a translation into English but represents a love and longing for home. I feel very passionately about Wales and the Welsh language so it seemed fitting. My monthly dashboard looks the same as ever. I’ve stuck with a yellow/orange theme for this page to match the washi tape and my Welsh theme. A couple of flowery doodles are also there to match my daffodil. I decided to stick with my new way of tracking habits for this month because I did like how neat it looked from my February spreads. I did however decide to change what I was tracking as I realised that some of the things I tracked last month didn’t really need to be tracked / tracking them wasn’t helping. You’ll notice that I’ve added some plant based doodles to this page and also a cute cactus to the bottom corner of my March Memories spread too. In keeping with my Welsh and plant theme, my mood tracker for this month is these pretty daffodils. I’ve managed to split it into 31 sections, so whilst this won’t end up being our traditional yellow daffodil, it’ll be interesting to see how it turns out. I definitely enjoyed having a go at drawing this (inspiration found on Google images!) and I’m really proud of how it turned out. My reading habits page stayed the same but this month I used bookish washi tape instead of patterned! And there you have it! I’m keeping the same weekly at the moment so I haven’t posted it again. You may have noticed that I am using more washi tape and little stickers to embellish my journal now too. It’s something I’ve just never really considered doing even though I own tons so I thought it was about time I make good use of them and I like how it looks. Do you use a mood tracker or habit tracker in your journal? Do you use washi tape and stickers to decorate your journal too? ← Q&A with Katie & Kevin Tsang | Authors of Sam Wu is NOT Afraid of Ghosts! I love how creative your mood trackers are! 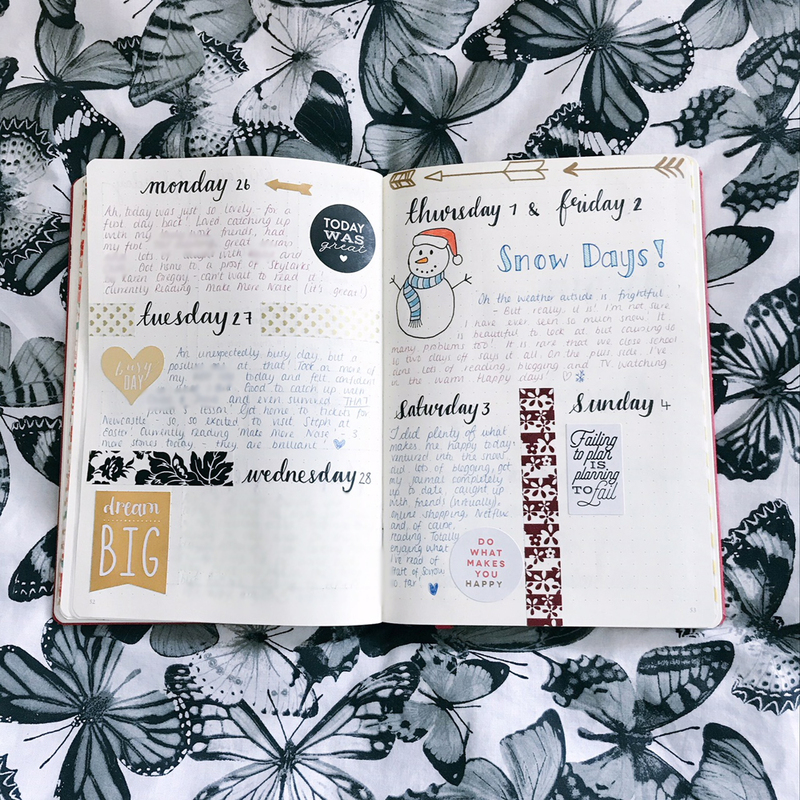 I love your Bujo setups Kelly, they are down so well and I especially love your mood tracker designs! I track mood, habits and sleep, but mine are pretty basic, my mood tracker is on the same page as my sleep tracker and is only three small boxes per day for me to color in. I also have a gratitude page, as well as 2 pages for monthly overview. I use a little bit of washi tape sometimes but for the most part I feel like it clutters my page so I mostly use it to mark long-term collections I flip to often. I’ve tried using stickers, but they hardly ever get used for the same reason. If I want some decoration I’ll doodle something instead – because that’s somehow less cluttering, although I don’t know how that can be! Well I absolutely love this! I’ve recently started #bujo and am obsessed!! The washi tape looks really nice as well – I’m definitely gonna try get my hands on some for my April spread! Yay! I own lots of washi tape but only this year have I really started sticking it in my journal a lot and I love how it makes the pages look! Your journal is amazing. So creative! I’ve tried to get into the habit of making/completing one, but I always lose steam. You’ve inspired me, though, so maybe I’ll try it again. Ah wow, that’s amazing to hear! Just make it work for you, it doesn’t have to be a daily thing. Sometimes I go a couple of days without looking in it and I backlog, but really it’s become part of my daily routine now. Really lovely post! I’m just using mine for my blog and reading at the moment. I’ve only done one page so far, starting with the reading challenges I’m taking part in this year. Thank you. I find myself changing up what I’m doing every now and then and I feel braver to experiment a bit more now!